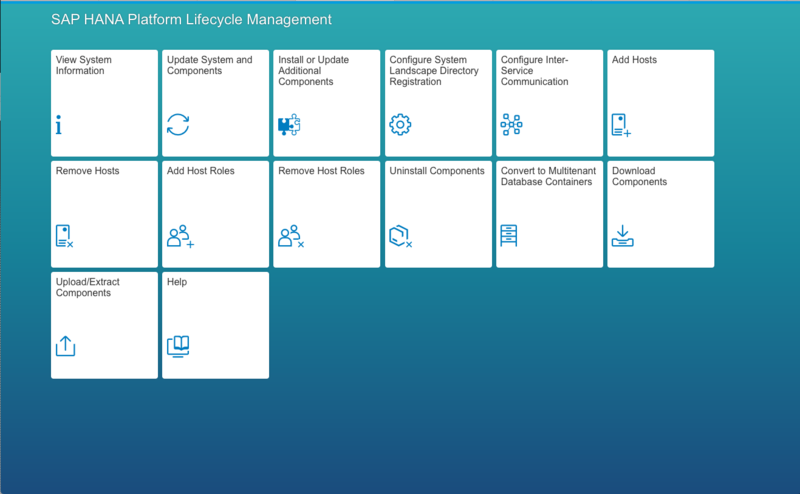 For those familiar with installing the SAP HANA server, there is some good news: the SAP HANA Server Installation and Update Guide is almost the same as the one for SAP HANA 1.0 SPS 12. In other words, the whole installation and update process is the same, so if you are familiar with this task you will no problem installing the HANA server. Both the SAP HANA Master Update Guide and the SAP HANA Technical Operations Manual are no longer included in the documentation set, the contents have been added to the Master Guide, section Updating an SAP HANA System Landscape and the section Operating SAP HANA. 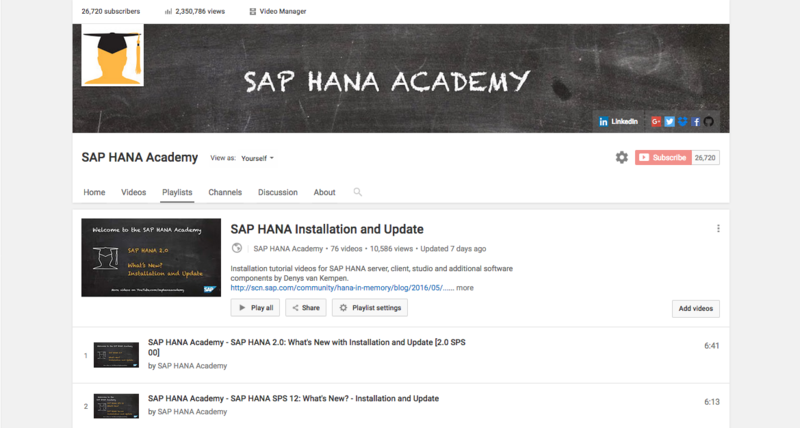 New is the SAP HANA Cockpit Installation and Update Guide and the SAP Web IDE for SAP HANA – Installation and Upgrade Guide, topics which will be addressed in a separate tutorial video. 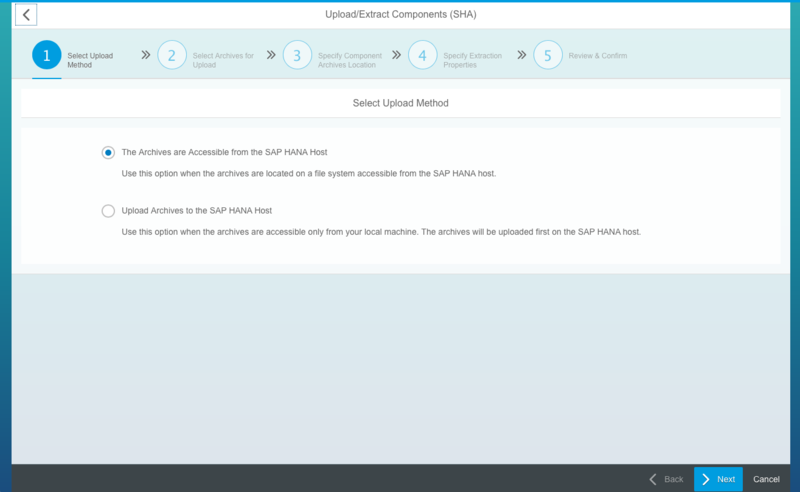 The Upload/Extract Components app allows you to upload files to the HANA server, or extract archives that are already on the HANA server, saving you the trouble to connect to the host with a terminal session to extract the file with SAPCAR, or connect to the host with FTP to upload a file. This is a great timesaver as typically in production landscapes the HANA server might not be directly connected to the SAP SoftWare Download Center (SWDC) so some staging is required. Another time saver is that to remove certain components like Dynamic Tiering, in the past two steps were required: 1) remove the host role and 2) remove the component. This has now been simplified: when you uninstall a component, the host role is removed automatically. SAP HANA 2.0 SPS 00 is supported on SUSE Linux Enterprise Server (SLES) 12 SP1 and Red Hat Enterprise Linux (RHEL) 7.2. The SAP HANA database lifecycle manager now performs a check to verify this condition is fulfilled. For more information about operating system support, see the notes section below. As there is already some discussion ongoing with SAP product management involved, I think this would be the best thread for an appropriate reply. finally “EHP8 FOR SAP ERP 6.0” (“Central Applications”) is supported by HANA 2.0 starting from 31.03.2017! NEW: SAP HANA database 2.0 iSp stack 00 Revision 2 is released for Enhancement Package 8 for SAP ERP 6.0. Also the PAM (https://apps.support.sap.com/sap/support/pam?hash=pvnr%3D73555000100900000247%26pt%3Dg%257Cd) confirms it. This is an excellent news! I am trying to install the SAP HANA Cockpit 2.0 but I am facing a problem, there are no solutions at sap marketplace or sap notes about this topic. The error is occurring at the installation process of HANA XS Advanced Runtime. 18:32:44.062 - ERR : Installation of SAP HANA Cockpit System failed. 18:32:44.062 - ERR :   Installation of SAP HANA Cockpit System failed. There are no more details about this error just aborting the Installation. That does not sound good at all. If this is a test system, best to completely remove the installation and start again. Maybe this provides some insight into what might cause the issue.